Home > Arts and Crafts Projects for Kids > Shell Crafts for Kids to Make crafts with sea shells, nut shells, and egg shells. SHELL CRAFTS FOR KIDS (FROM EGGS, NUTS, SEEDS, & SEASHELLS) : arts and crafts decorations, instructions, patterns, and activities for children, preschoolers, and teens. Next time you visit a beach, be sure to collect as much shells you can, big or small. These shells can be used to make the most beautiful crafts out there. I will give you a few example. For boys, they can make mini sail boats that actually floats. For these boats you will also need a small piece of plastic bag or cloth, a small thin twig, and modelling clay. Basically you trim the cloth/plastic bag into a small triangle and slide the twig though it then place the modelling clay inside the shell and stick the sail (cloth/plastic bag and twig) into it. For girls, they can either paint the shells or use them to make beautiful pendants or decorate to a jewelry box (for example, a paper mache box). 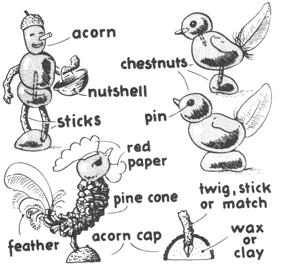 All you need to make a chicken farm are some walnuts, acorns, chestnuts, pine cones, feathers and sticks. You can collect all the material on an autumn walk. Just follow the illustrations to make the farmer and his flock. Twigs, sticks or wooden matches cut to the right size make the farmer's arms, legs and nose. The chickens' beaks and legs are also little sticks. Their eyes are pins. Drill small holes in the nuts so you can insert the sticks. Your figures will stand upright in a lump of wax or clay. 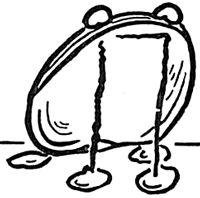 Did you ever look at the shape of a shell...it is very similar to the shape of a bullfrog, isn't it? Yes....look at the picture above and you will have to agree with me. The next time you are on the beach, keep a look out for a shell that is about 2 to 3 inches wide...with a corrugated box-like effect. The bullfrog can be made by getting one of these big shells, keeping it the hinge-side down (where there is a little bit of a lip), with two tiny shells for the eyes and 4 larger shells for the feet. Use pipe cleaners to attach the front feet to the shell...with a square shape. Glue it to the under body of the shell to make sure that it stays standing. Glue the back feet to the back of the shell. Chestnuts are useful for all kinds of birds. Different sizes and shapes give variety. The turkey's fan-shaped tail and stretched wings are made from folded paper. The perky sparrow also has paper wings, and you can use a real feather for his tail. The pheasant is a slim, proud forest bird. 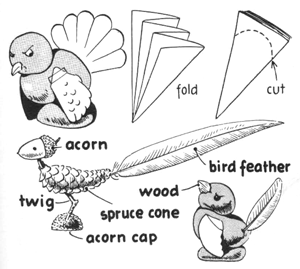 Make his body from a spruce cone and his head from an acorn with the cap. Add a long feather for his tail. You can add many more animals to your barnyard. Here the sheep's head is an acorn, attached with a match to his chestnut body. His legs are bent twigs, his eyes are pins or nails and his ears are made from paper, put on with paste or tape. And his tail is made of wool. 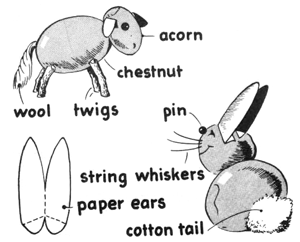 The rabbit also has an acorn head and a chestnut body. His ears are paper, his fluffy tail is cotton, his whiskers are string and his nose is a pin. You can paint his smiling mouth. 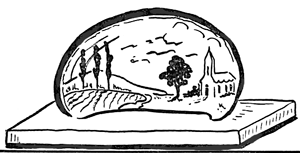 On the inside surface of a large, open-faced shell, pictures of scenery may be painted. Use oil or acrylic colors and paint as you would on a canvas. Mount the shell upright, in a block of Plaster of Paris, plunging the hinge side of the shell into the plaster. To make this block of plaster, place wax paper on the inside of a chalk box and pour the plaster mixture into it. Pour in enough to make a 2" depth, with length and width greater than the shell, but proportionately so. After you have projected the hinge side of the shell into the Plaster of Paris, while the latter is still soft, press the plaster up around the shell to assure its rigidity. Remove the plaster from the box after it has hardened and smooth it off, or leave it in a rough condition. The base may be painted or left plain. The shell trumpet will appeal particularly to those who go camping, and to young persons who like to play in groups. Take a large, closed shell—this will have to be a sea shell—and have your Mom or Dad cut off the apex (this is the sharp conical point of the shell) . Cut just enough to leave a good hole through which you may blow. 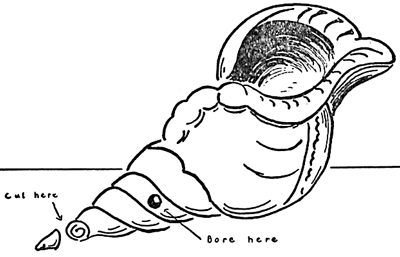 In the side of the shell, ask your parents to help and bore a hole. This is necessary to produce and carry a loud tone. It is not necessary to paint the trumpet, though you may if you wish. 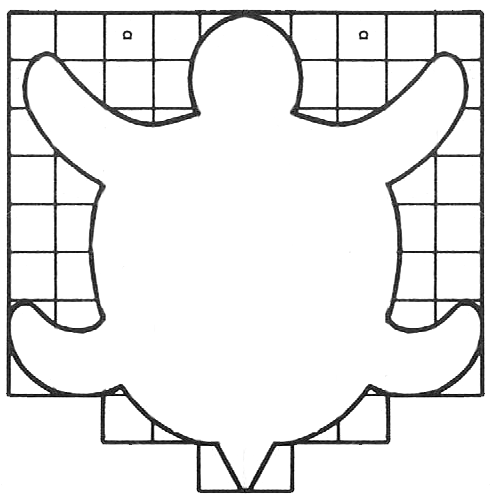 First of all, print the following turtle template. Then pin this to felt and cut it out (or you can use heavy paper or cardstock if you don't have felt). Glue or sew beads or sequins (or just use googly eyes) to the head for eyes. Now mix 1 tablespoon of water to every 3 tablesppons of plaster of Paris or Patching Plaster. Mix it to a thick consistency. Now fill the shell with the plaster and put it in the sun until completely dry. Now glue the shell to the turtle's body and let dry. These make great paper weights. Make Earrings with Sea Shells for Mom on Mothers Day - Sea Shell earrings turn out beautifully and they are very simple to make. Below you can find easy instructions for putting together earrings that are made from sea shells and earring clips. These would make a great gift for Mom or your Grandmother on Mother’s Day. How to Make Walnut Mayflowers - Don't throw out those walnut shells...keep 'em. Use them to make a really cool Walnut Mayflower for Thanksgiving. How to Make Walnut Shell Napkin Rings - Find out how to make these napkin rings for the Thanksgiving table out of walnut shells. Make a Sailboat with a Nut Shell & Toothpick - Making a Sailboat is a lot of fun, especially when they actually work...find out how to make it here. Make a Turtle Creature from Wax and a Nut Shell - You can make this adorable turtle too with the easy-to-follow instructions meant for children. Make Blown Egg Shell Creatures - Here are instructions for making blown egg people and creatures with eggs. Seashell Bracelets & Earrings - Learn how to make seashell jewelry that turns out beautifully. Make a Musical Instrument with Walnut Shells - Learn how to make this cool walnut shell musical isntrument. Sea Shell Turtles - Find out how to make these sea shell turtles with specific shells and pipe cleaners. Peanut Giraffes with Toothpicks and String - Make a Toothpick Giraffe with Peanuts inside their shells. Making Chestnut Bubble Pipes- With parental assistance, you can make one of these pipes to blow the best bubbles with. Find out how. Make a Puppet from Peanuts - If you aren't allergic to peanuts, then this is a pretty easy marionnette to make....and it is so much fun to play with. You can make it do all sorts of crazy things...dance, walk, skip, jump. It is a LOT of fun. Christmas Walnut Ornaments - Find out how to make fancy walnuts for hanging on Christmas. Paint Dipped Pinecone & Walnut Ornaments - Find out how to gold or silver dip pinecones & walnuts for decorative Christmas Ornaments. Baby Chick Arts & Crafts Ideas - They put the chick in the photo in a clean, empty egg shell for decoration. These bird crafts are so cute! Bed Sheet Shell Craft : Crafts with Old Bed Sheets for Kids - All you’ll need is plain (white) sheets, such as these here, some fabric paint, a little sponge, and a handful of perfect clam-shaped shells. Birthday at the Beach : Birthday Crafts for Kids - - Looking for party ideas? Shell necklaces are perfect accessories for a funny, sunny Birthday at the Beach party. They’re easy to make and colorful too! Candy Dish with Broken Egg Shells Craft - The candy dish in the photo is one of many easy Christmas crafts that you can make using broken egg shells. Chime Bracelets : How to Make Bracelets - Made with shells or lightweight trinkets, these bracelets are fun to wear because they jingle when you move. Coconut Shell Bird Feeders . : How to Build Bird Feeders and Houses - Here's how to make a natural bird feeder that will blend in with any garden landscape. You can fill it with a variety of foods for the birds. Coconut Shell Birdhouse . : How to Build Bird Feeders and Houses – Give a tropical feel to your backyard as well as a Pacific/Oriental style abode to the birds in your area with this coconut birdhouse. Confetti Filled Eggs Easter Craft for Kids - Kids will love surprising their friends when they crack open these fun confetti filled eggs made with real egg shells. Be environmentally friendly by using biodegradable confetti for outdoors. Decoupage Surprise Window Eggs Craft - You can use real egg shells to make beautiful decoupage window eggs - without having to blow out the egg before making your breakfast omelette. Just crack the eggs in half, as you normally would, then follow our free craft directions to decoupage them together, incorporating a window opening to show the surprise candy inside or to enclose a special Easter treat. Decoupaged Eggshell Trinket Box Craft Project Ideas for Children - Decoupaging with broken eggshells is a technique that I've been meaning to try for years. Rather than attempt a collage, I chose this faux mother-of-pearl effect to decorate a small wooden trinket box. The finished box is surprisingly strong, and there are no flaking egg shells after two coats of decoupage and two heavy coats of iridescent pearl paint. Easter Egg Mosaic Pin Craft Activity - This is a fun way to use up broken Easter egg shells. Dye a few ahead of time and make the pin before Easter. Easter Egg Mosaics Arts & Crafts Project - Save all those peeled Easter egg shells to make a mosaic picture. Easter Egg Trees Craft for Kids- Make a cute easter egg tree with egg shells and paint. Easy Egg Shell Candles for Easter or Birthdays - This is a simple craft, but you'll find that little egg shell candles look right at home on the Easter breakfast table. They also make interesting birthday candles as well, especially if you can't indulge in calorie-rich birthday cake. Egghead Easter Craft - This is a fun project for Earth Day, Easter, or just about any spring day you can think of! No fancy materials are needed. With just an eggshell, a little soil and some seeds, you can grow your own egghead. Eggshell Bouquet Crafts Activity - Decorate the Easter table with an arrangement of these delicate blooms. Eggshell Easter Baskets Arts & Crafts Idea - A cool pr oject that makes a basket that looks like an egg shell. Egg Shell Mosaic Card Crafts Project for Kids - Make an unusual Easter keepsake with an Egg shell mosaic card--a simple and entertaining craft for groups or for individuals. Eggshell Mosaic Picture Craft for Kids - Next time you bake a cake don’t throw away the egg shells - use them to create a lovely eggshell mosaic picture! Perfect as an Easter or spring craft. Eggshell Mosaics Crafts Ideas - This craft takes advantage of the fact that rainy days seem to happen at the time of year that Easter paraphernalia appears in the stores. Eggshell Posy Vase Craft for Kids - How to make a sweet little posy vase from an eggshell - perfect for tiny flower bouquets on Easter, Mother's Day or Valentine's Day -- or just to give someone you love along with breakfast in bed! Eggshell Mosaic Picture Art - Your children can create works of art by recycling your colored Easter egg shells. Eggshell Plant Pots Easter Craft Activity - Make and decorate tiny eggshell plant pots for Easter. Then watch your plants grow. Eggshell Ships Crafts Activity for Children - With a tissue paper sail, this boat is kitchen sink-worthy (as long as the wind remembers not to blow too hard). Eggshell or Egg Carton Tulips Craft - Make a bouquet of delicate eggshell tulips for Easter, using eggshells (or foam egg cartons sections) and pipe cleaners. Younger children will find it easier to use the egg carton sections. Glittery Shell Fish : Crafts Ideas for Kids & Saving Vacations Memories - - Compare and contrast various forms of ocean life, identify shellfish by their shell characteristics, and create ocean scenes inside shells. Good Fortune Walnut : Christmas Ornaments Crafts for Kids- This ornament is inspired by the Victorian tradition of hanging gilded walnuts on a tree, each holding a special fortune in its empty shell. Granny Mouse Ornaments : Pantyhose Crafts Ideas for Children - - These ornaments can be made in large quantities. Begin by spreading walnuts out onto old newspaper for painting. If the weather’s warm, you may want to do this step outdoors to ensure ventilation when using spray paint. Spray all walnuts with red paint. Allow to dry thoroughly. You will need to repeat this step to ensure all sides of walnuts are covered. Green-Haired Eggheads Craft Idea - Easter meals can be fun, thanks to some Green-Haired Eggheads! These eggshell people are fun to make -- and later they'll provide nutritious sprouts too. Ask your family to save all their empty eggshell halves for you. You'll keep the whole family giggling -- and saying "Yum!" Homemade Stepping Stones : Rock Crafts for Kids - Stepping stones cost a pretty penny at garden supply shops, but your kid can make one cheap by raiding the local craft and hardware stores. Plus, you'll finally have something to do with all those seashells your kid collects every time she hits the beach! How to Make Eggshell People Craft Idea - These eggshell people are easy to make and silly to look at. Kids will love watching the "hair" grow. Plus, it will help teach them responsibility when they are put in charge of watering the little people every day. How to Make a Nutty Bunny - Here's an Easter nutty bunny to make from natural materials, using a walnut and two almonds. How To Make An Eggshell Vase Crafts Project - This is a very easy to make craft. Hollowed-out eggshells make naturally beautiful vases for tiny flower arrangements. Save that egg shell from breakfast and make a sweet little posy vase for tiny flowers. Kids' Art Necklace - A shell pendant framing a diminutive drawing becomes a wearable work of art. Make your own Easter Egg Shell Vase - Learn how to make this vase with easter egg shell. Napkin Applique Easter Eggs Crafts Idea - Ever wonder how to hollow out an egg shell? You're in luck. It's the first step of this napkin applique Easter egg craft. Native American Rattle Craft from Nature - You can make a simple yet beautiful Native American rattle from a twig, yarn and beads. When you shake it, it makes a rattling sound. Many Native Americans made ceremonial rattles from natural objects (like deer hooves strung on twigs or rib bones). In this craft, we use beads, spools, washers, or shells as noise-makers. Newspaper Maracas - Musical Instruments that you bang, scrape or shape are called percussion instruments. Some examples of percussion instruments are drums, rain sticks, xylophones and maracas. Maracas were originally made from the dried shells of gourds with beads or beans inside that rattled around and made lots of shuck-a-shuck-a-shuck-a noises. You can make maracas using simple materials from around the home. What follows are two methods ... the first requires a little more time, while the second method is simple enough for the younger grades to tackle in an afternoon art making session. Nutshell Bird Feeders - Tiny nutshell bird feeders are thoughtful little gifts and an easy science activity that you can make with kids. The next time you eat a nut, save the shell. The birds will enjoy these little treats, and your kids will enjoy watching them eat. Nutty Boats - Learn how to make these Walnut Shell Boats with Twig/Stick Masts and Leaf Sails. So cute! Nut Turkey Craft for Kids : Thanksgiving Turkeys Crafts Activities - What you will need: Peanut in shell, walnut in shell, unpopped pop corn kernels, wiggly eyes, ribbon, and glue. Ocean Mobiles : Hawaiin Crafts Ideas for Children - This is a simple mobile made up of printed ocean shells and fish (you could add real shells with small holes in them as well!). Ocean Shells Diorama – Remember those long walks you took with your kids along the seashore and finding some beautiful seashells along the way? Now you can put those to good use by making this ocean shells diorama craft and relish the moments of times gone by. Paper Squirrel Favors Crafts Activity - Guests will go nuts over these cute critters. Squirrels perched atop logs filled with foil-wrapped chocolate chestnuts, hazelnuts, and walnuts make sweet seasonal tokens. Put one at each setting at the Thanksgiving table. If you'd like, you can write guests' names on the logs before assembling them so the favors can double as place cards. Patriotic Sea Shells : Patriotic Arts and Crafts Projects - - What a great way to celebrate the 4th...searching the seashore for the perfect shells for your patriotic display. Sailing Walnut Boats - To make this craft project you will need a walnut shell, a toothpick, a tiny lump of clay or gum, a piece of paper, and some markers. Those are pretty easy to get materials for a fun to make project. Seashore Collage Today is going to be a day the children can imagine they are by the seashore collecting shells. After they imagine this, they can make a collage of their "findings." Seashell Koalas Crafts Idea - Sea creatures are notoriously shy, but the ones you see here managed to come out of their shells to greet passersby. You can find seashells year-round in craft stores and some gift shops. Seashell Picture Frame : Arts and Crafts Activities to Save Vacation Memories - - Use sea shells and sand gathered during your vacation to frame your favorite vacation photo. Seashell Refrigerator Magnet : Arts and Crafts Activities to Save Vacation Memories - - This pretty vacation craft is made from shells and corals collected from a beach outing. See the Sea : Arts and Crafts Activities to Save Vacation Memories - - What to do with your seashell collection? Relive your warm beach memories with these colorful shells. Seashell Sailboat Natural Craft Ideas - This mini craft takes only a minute or two to assemble, and it's just right for launching in a kiddie pool or bathtub. Seashell Wind Chime : Instructions for Making Wind Chimes - Bring the sight and sounds of the beach home with you. Seashell Wind Chimes : Instructions for Making Wind Chimes - There are many things you can make with seashells. Shell Photo Frame : Grandparents Day Crafts Activities Ideas - - Take advantage of a trip to the beach to collect shells for this pretty shell photo frame - it makes a sweet gift which the kids can make themselves, too. Sleepy Bunny Egg Shell Crafts Idea for Kids - This cute little bunny fell asleep inside of one of your Easter eggs! Shhh, don’t wake him--he needs his strength to deliver those goodies. Snail Shell Place Cards Crafts for Kids- Make homemade placecards out of snail shells. Super-Strong Eggshell Arches Science Project Activity for Kids - Super-strong eggshell arches can hold up a lot more than you think. Even made of eggshells, arches are strong because they exert horizontal as well as vertical force to resist the pressure of heavy loads. Hard to believe? Try it for yourself with this science experiment for kids. Summer Fun Keepsake Box : Box Crafts Instructions for Kids Gather sand, shells or small rocks during your summer to decorate a box to keep your treasures in. Trusty Turtle Walnut Craft for Kids - This is a cute project that takes a little thought. Walnut was used for the body and ash for the fenders. Walnut Diorama – Teach your kids not to waste any Yuletide decors by showing them how to create fun and unique projects such as this diorama craft using walnut and a simple hanger. Walnut Mice - This sleepy trio of Christmas mice is safely tucked in bed and waiting for Santa.